I haven’t worked in 3D at all before, and I was looking for a simple project. As with the Brio/Duplo wagon, I was thinking about what was within my ability, and not commercially available. I decided I would try to build a custom tire valve stem cap with my daughters’ school logo (a polar bear). Looking at freely available 3D modelling tools, I checked out Blender and OpenSCAD. OpenSCAD seemed to be simple for someone starting out with designs built out of basic shapes. I converted the bitmap logo I had to a vector drawing using Inkscape‘s “Trace Bitmap” feature. Following an Instructables tutorial, I exported the bear’s outline and features to a DXF file, which can be imported into OpenSCAD. I encountered number of difficulties (it has been a while since I completed the design – I can’t remember which issues, specifically, I encountered). I tried again, with great results, using the Inkscape OpenSCAD export plug-in. I merged the bear with a cap designed by Dan Ujvari, and printed it at the Toronto Public Library’s innovation lab. I used a black permanent marker to highlight the bear’s details after printing. It was interesting to learn that even with a simple project as this one, there are limitations to 3D printing. It was almost impossible to remove the support material on the reverse side, as the bear is narrower than the cap. If I were to refine the design, I would make the bear the same width as the cap. I definitely have more to learn about successfully designing an object around the limitations of current 3D printers. 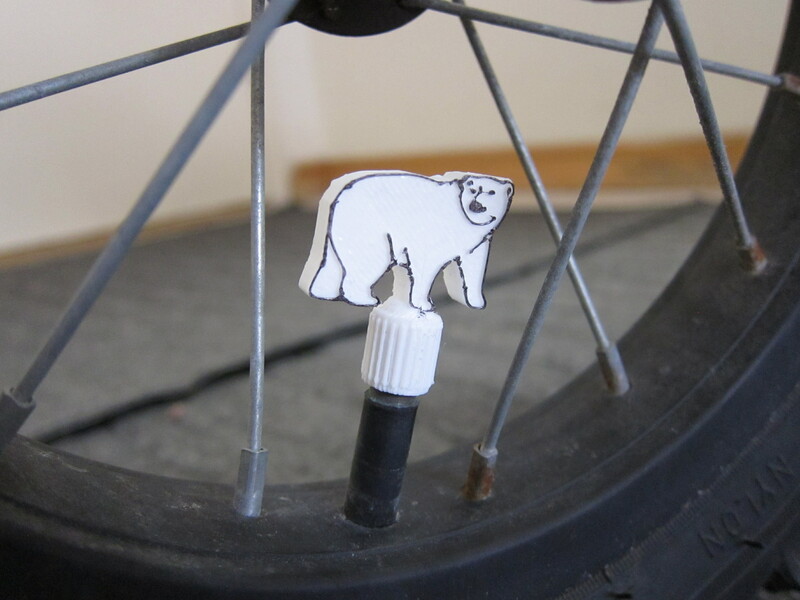 This Polar Bear Tire Valve stem cap can be downloaded from hotelexistence.ca or Thingiverse.